Hubby sent this ad the day before it was published in the newspaper. I was busy checking resistoflex teflon hose for our gas stove when he emailed it to me. I thought he was trying to imply something like he would reserve a seat for us. Well, it’s not. He sent it so I can share it to those looking for cheap airline tickets. National Heroes Day Super Sale! 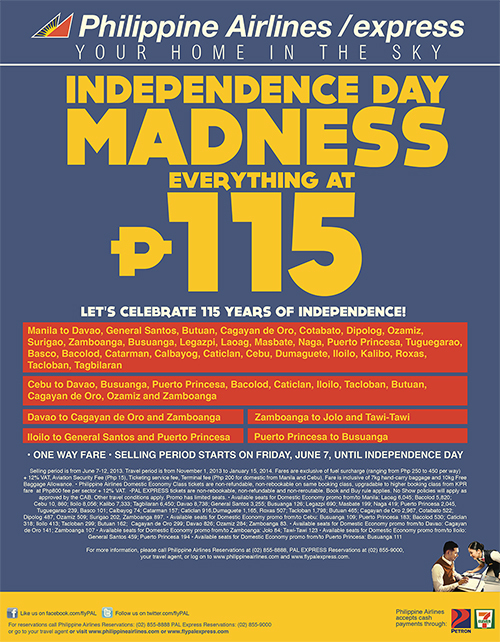 This entry was posted in Travel/Airfare promo and tagged Independence Day Madness, PAL Express, Philippine Airlines, seat sale on June 7, 2013 by Yami.